The Nigerian newspaper Leadership reports that the comptroller-general of the Nigeria Prisons Service (NPS), Mr. Zakari Ohinoyi Ibrahim, told the House of Representatives Committee on Interior led by Umar Bature recently, that congestion has become the common feature of prisons. According to Ibrahim of 50,601 inmates in the various prisons, 36,934 are awaiting trial. The figures do not include those held in police cells. He observed that “a majority of them fall into the capital categories, such as armed robbery… because of their profile, nobody is anxious to release them from prison”. The British government recently said it would spend N250 million (US$1,56 million) to build a prison in Nigeria to house 400 Nigerian inmates presently jailed in British prisons. Senate president David Mark says this is in terms of the Transfer of Convicted Offender (Enactment & Enforcement) Act (Amendment Bill 2001) and because the current custody conditions in Nigeria are poor. The John Odah committee set up by Abbah Moro, the interior minister, had earlier returned a damning verdict on the state of Nigerian prisons. “Our prisons are housing more than a triple number of inmates that they were built for,” Odah pointed out, adding that congestion caused by the slow-speed trial of inmates “accounts for more than 90 per cent of prison population in urban centres”. Nigeria’s prisons are not fit for human habitation, a Senate Committee once reported, after visiting some of them. 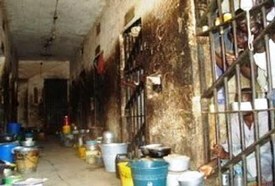 Nigerian prison detainees are usually ill-treated. Some of the detainees are kept under inhuman conditions, shackled, and hooded. Some are kept there for eternity while many spend 15 or more years without trial. Leadership commented "This is sheer inhumanity reminiscing the slavery days."